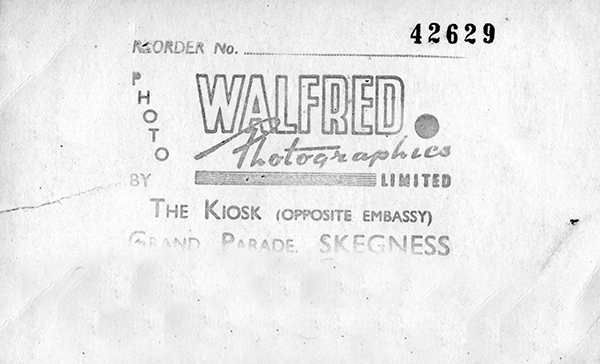 Walfred Photographics Limited were based in Skegness, with a kiosk opposite the original Embassy Theatre (now redeveloped) on the Grand Parade in Skegness (the Parade Cinema can be seen in the background of some of their walkies). Skegness already had a busy walking pictures company in the firm of Wrate’s, but this didn’t deter the new firm who must have felt there were more than enough potential customers for everyone. The company was registered on April 12th 1948, which suggests a business set up post-WW2 by ex-servicemen. 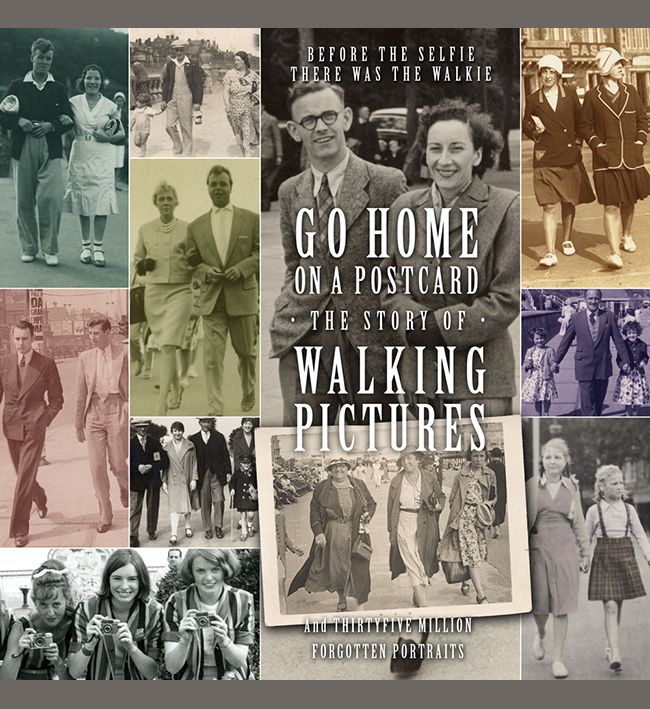 They began taking walkies right away, I have an example dated from 1948. Whether this was their only line of business to begin with I do not know. But by 1958 the firm was also producing photographic multi-view postcards of Skegness (with a kitten added to some!) as well. It seems probable that they also undertook other types of photographic work, processing and printing. One of the staff, Ken, recalls (on a local BBC site) dashing home to get his camera during the east coast floods of 1953. Walfreds also ventured out of the area, and we have a walkie identified as from Boston taken by the firm. Boston is 24 miles away, so we’re not sure how the firm processed or sold the cards taken there. Peggy , Tony and Paul. Another of the staff was Clarence Walker, who may have been the WAL of the company name. He married in 1950 when the firm was said to have offices on the High Street (which may have been their main base from the start). I do not know when Walfreds gave up doing walkies. The firm appears to have stayed in business through the seventies but I have not seen any walkies by them much later than the early sixties. Under the guidance of director H. Atherton decided to wind the business up in 1981. Atherton had also been involved in his own walkie business in the seventies. Sharpe – Atherton (covered on this site) operated from the fabulously named Linga Longa Studio on Winthorpe Avenue in Skegness and took smaller machine printed colour walkies for a while. 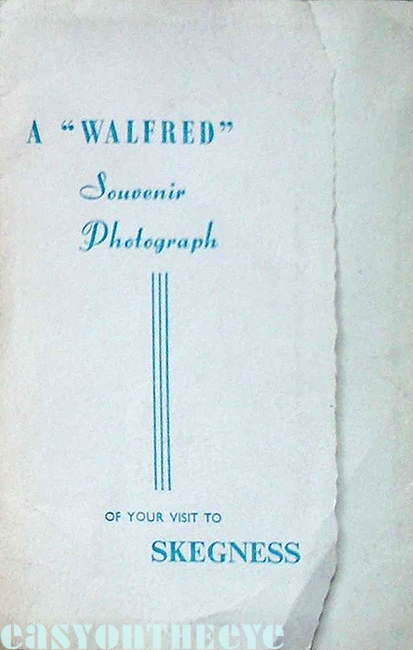 I have several examples of walkies by Walfreds, which are all standard postcard size with a blank back (apart from an elaborately designed rubber stamp with the company details) and a reference number applied via a numbering machine. The firm also sold their walkies in card envelopes for a time, like their rival Wrates. The first walkie was taken in Boston Market Place during the last week of March 1948. It was sent by Ruth Bishop. 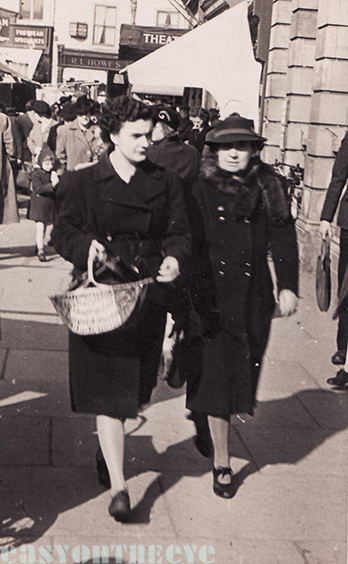 “We know the date because it was the week before my mother’s wedding (Mar 27th 1948). So she said!” The two people in the picture are Ruth’s mother Audrey James (left) who was 19 at the time, though she looks much more grown up here! Emily was her mother, aged 55. Ruth recognised the location as Boston Market Place, the north east corner, with the two ladies walking briskly past what is now the Nat West Bank. It is clearly market day (so a Saturday or Wednesday then!). The Walfred’s camerman has actually got the focus wrong, with the buildings in the background noticeably sharper than the two ladies. This was one of the problems in photographing people at speed. Nevertheless the print was bought. 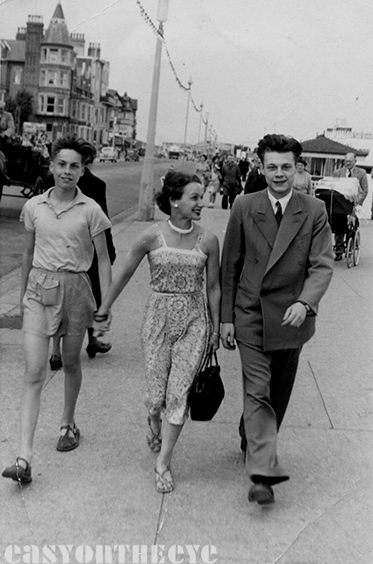 The second Walfred walkie was sent by Phil Harrison, and shows his mother’s aunt Peggy Foster and her two sons Tony and Paul on the Parade at Skegness, Walfred’s home turf. A recent check of print numbers in our archive suggests Walfred may have numbered walkies consecutively from day one. Print 592 is the earliest dated 1948, with numbers 7,245; 18,271; 42,629; 51,120 and 51,211 (the same people on the same holiday); up to 57,057 the highest number in the collection. This pattern is similar to the numbering on Sharpe Atherton prints. If correct it gives us a running total of photographs taken, close to 60,000 over a roughly ten year period. In later years Walfred’s concentrated on taking photographs and pubs especially the Blue Anchor at Ingoldmells, bit of friction between Wrates and Walfred’s operators if they encroached on each other’s pitches. I have been given a photo recently numbered 62827 with a band performing on it and was wondering if I could get any information about it please.